Seven OHL newcomers lit the lamp for the first time in their young careers on Friday. 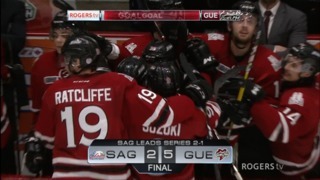 Here’s a rundown of fresh Milestone Moments to start another weekend of OHL action. 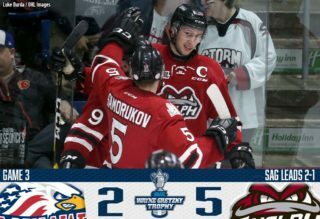 Rookie defenceman Daniil Chayka‘s first OHL goal opened the scoring in a 6-2 Guelph Storm victory over the visiting Owen Sound Attack. Chayka released a wrister from the top of the circle that snuck through Attack goaltender Mack Guzda as Mason Primeau and Cedric Ralph gathered assists. The Moscow, Russia native starred for the Toronto Jr. Canadiens last season before becoming Guelph’s first round (seventh overall) pick in the 2018 OHL Priority Selection. Chayka scored his first goal, and he set a fellow rookie up for one of his own. 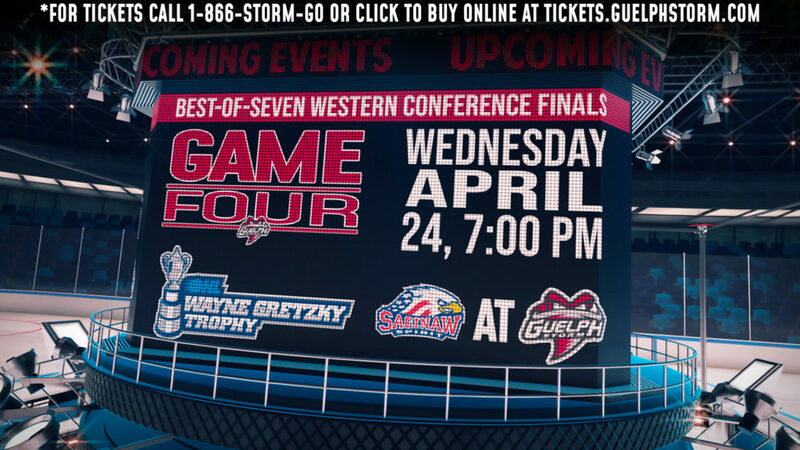 Ty Collins tipped a Chayka point wrister past Owen Sound’s Mack Guzda midway through the third period to put the Storm in the driver’s seat up 4-2. Collins’ first goal comes in his second game. The Newmarket, Ont. native was a member of the OMHA Champion York-Simcoe Express last season and was selected by the Storm in the second round of the 2018 OHL Priority Selection. Flint Firebirds rookie Jacob Winterton took a pass from Jake Durham entering the zone, firing a quick shot past the arm of Sarnia’s Aidan Hughes 5:55 into action. Unfortunately Winterton’s marker would be the only Flint goal on the night as they fell by a score of 4-1. A 17-year-old native of Whitby, Ont., Winterton was Flint’s 10th round pick in 2017 from the Ajax-Pickering Raiders Minor Midgets. He spent last season with the Raiders Midget AAA team, producing 33 goals, 19 assists and 52 points in 33 contests. Antonio Stranges stuck with what looked like a broken play, scooping up a puck in the slot to fire it past Sault Ste. Marie’s Matthew Villalta and tie the score at two. The London Knights would fall 5-3 in the contest, but it’ll always be a memorable night for Stranges, who had help from Alec Regula and Cole Tymkin on the first goal of his OHL career. London’s second round (21st overall) pick this past spring, Stranges hails from Plymouth, Mich. and put up 22 points (13-9–22) in 12 games with the Detroit Little Caesars U16 squad last season. Sudbury Wolves rookie Jack Thompson sent a shot through traffic that found its way past Oshawa’s Cole Ceci 5:09 into the second period. Thompson’s first sparked a Wolves comeback as they proceeded to score four more times in a 5-2 home opening victory. A native of Courtice, Ont., Thompson was the 30th overall pick of the 2018 OHL Priority Selection, serving as captain of the Clarington Toros Minor Midgets last season. Swiss addition Kyen Sopa fired a shot on goal that caromed off the body of a Kingston defender and past Brendan Bonello to open the scoring in Niagara on Friday. 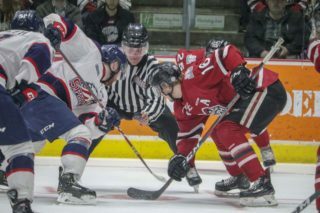 The IceDogs defeated the Frontenacs 3-1 as Sopa got on the scoresheet in his third OHL contest. The 36th overall pick of the 2018 CHL Import Draft, Sopa skated with Bern of Switzerland’s top junior circuit last season. He’s a late 2000-born player eligible for the 2019 NHL Draft. 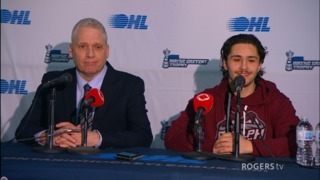 Sixteen-year-old forward William Portokalis teamed up with Nicholas Canade to score his first OHL goal, finding the back of the net past Erie’s Noah Battaglia on a breakaway backhander 2:59 into the third period. The goal put the Trout up 5-0 in a game they’d eventually take by a score of 6-1. Portokalis’ goal comes in his third game as the Don Mills Flyers graduate is off to a good start in the OHL. The Mississauga native was the club’s second round (39th overall) pick back in April.